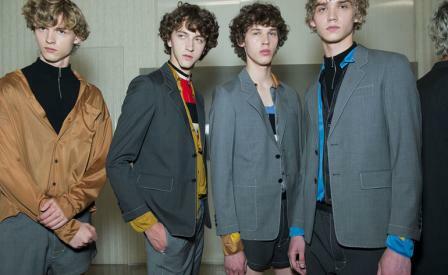 Mood board: What was pinned to Miuccia Prada's mood board this season was anyone's guess, but we couldn't help but imagine a series of 1950s boys wearing boxy underwear or poor shorts, grandpas in their pyjamas, and Con Ed guys and gas station attendants in matching two piece uniforms. The references were everywhere and nowhere as Prada constructed a fluttering, utilitarian take on layered spring clothing that was all her own. Best in show: A large portion of the men's contingent of the audience coveted nearly every look in this wearable show. The fluid wide-leg track pant with workwear taping detailing, the shrunken jackets and the fluttering baby shorts were just a few of this season's gems. Finishing touches: Just as the rest of the world has finally caught up with Prada's jagged edge flat-form shoes, Mrs Prada moved on. Next spring her men's shoes, including holey lace-ups or slip-on booties are completely sole-less. Handbags on the other hand were blown up to tent-sized knapsacks crafted from pin-striped silk.